Scott Hall is envisioned as a crossroads, connecting research space between multiple buildings in Carnegie Mellon University’s engineering and science precinct. Intended to enable thematic research across many disciplines and institutes within the University, the laboratories are designed to be flexible in configuration within a floor plate. Tremendous variation in lab configuration can be seen throughout the building vertically. Each level exhibits different ratios of lab to lab-support, office and collaboration space. The laboratory planning is based on a “transparency” or “open neighborhood” concept. This concept brings together, in a single area, all the resources that a research group uses on a daily basis. In the case of Biomedical Engineering, laboratory “neighborhoods” promote greater productivity, eliminate the need to duplicate expensive lab support spaces, and foster a strong sense of scientific collaboration and community, hence strengthening research opportunities. 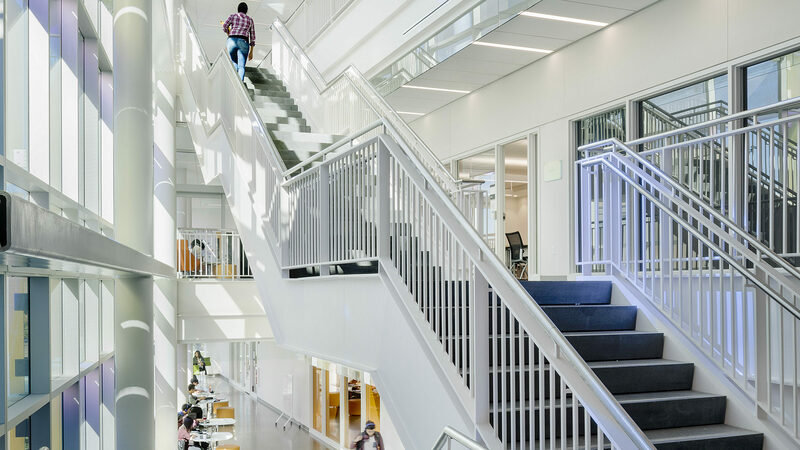 Scott Hall received LEED Gold Certification from the USGBC despite its systems-intensive research program and features one of the most energy efficient research grade clean rooms in the world. The team for Scott Hall included: OFFICE 52 Architecture, design architect; Stantec, architect of record; ARUP, structural, mep, fire protection, lighting, vibration & acoustical consulting; Davis Langdon, cost consulting; Jacobs, lab planning & cleanroom consultant and Jendoco Construction Corporation, construction manager and general contractor.